Run Depfu behind your firewall and keep your enterprise software dependencies up to date effortlessly. Get notified about new versions right where you work, with a pull/merge request. Depfu Enterprise runs on your infrastructure (with minimal requirements) with either GitHub Enterprise or a self hosted GitLab instance. Depfu Enterprise also supports any CI solution that works with these choices. It works with your private packages hosted on your own repositories like Geminabox, npm Enterprise or JFrog Artifactory. Depfu Enterprise uses Replicated under the hood, which makes it easy to install and easy to regularly update with a single click. We're releasing Depfu Enterprise regularly and keep it in lock step with our SaaS product. 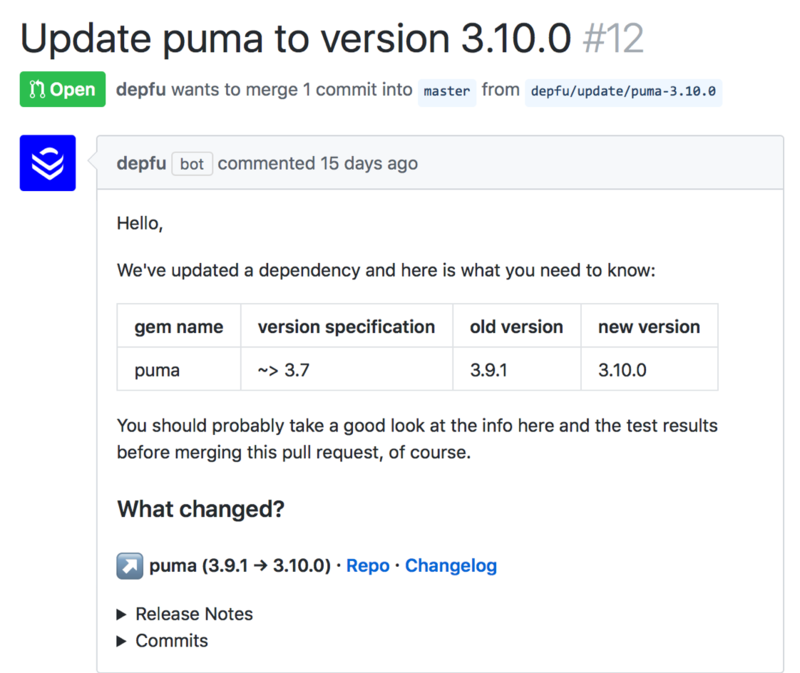 By default, Depfu Enterprise pulls package metadata from our own API to improve the pull requests. But of course your code never leaves your network. Depfu Enterprise can run in an airgapped environment if needed. To install Depfu Enterprise in your infrastructure, you'll need a single Linux machine (VM or metal) that supports Docker and uses one of the supported distributions. It should have at least 2 Cores and 8 GB of RAM available. Of course these requirements could scale a bit with the number of active users and the number of active projects, but generally Depfu Enterprise doesn't need a lot of resources.